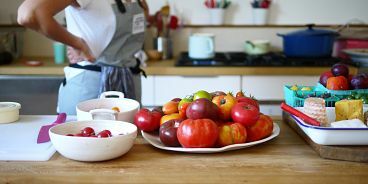 If you’re an aspiring food stylist and photographer, or perhaps a home-cook who simply loves to shoot photos of beautiful food, consider a food styling and photography workshop with James Beard award-winning food blogger Aran Goyoaga of cannelleetvanille.com. Spanish-born Aran is based in Seattle, the perfect destination for a food-centric weekend. For her latest course, she teamed up with California-based photographer Leela Cyd, who focused on more technical elements of food photography. The workshop I recently took began in Aran’s charming white studio. The self-trained stylist and photographer began with a baking demo, which was shot by Leela, who then went on to explain angles of shooting. We then watched Aran plate and style multiple mouthwatering dishes in a most effortless, beautiful fashion. After an amazing lunch of quinoa salad, homemade butternut squash soup and heirloom tomato salad, we students were given a table filled with a most gorgeous slew of edible props from which to create our own images. Aran and Leela finished by sharing their personal stories and tips on how to get into the business of food photography. Food styling school doesn’t really exist. If you’re wanting to hone your skills, a Canelle et Vanille food styling and photography workshop is a grand idea. See the list of upcoming classes here.